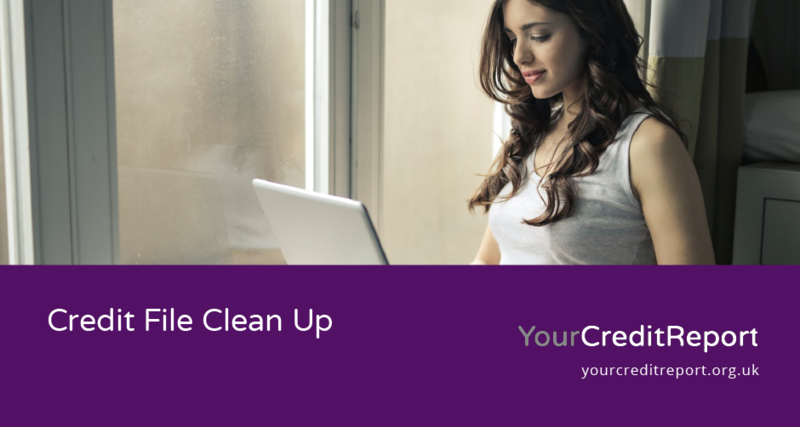 A credit file clean up refers to the process of clearing debts and improving your overall credit score. Everyone should consider requesting copies of their score at least once a year in order to clean them up if required. The first step to get started is to register with one of the credit report agencies who can issue a report for review. For a small fee, you can request a copy of your credit record from agencies such as Experian, Callcredit or Equifax. It is also possible to see your credit records in real time with Experian CreditExpert and although this is charged with a monthly fee, you can get the first month free with the option to cancel. If you are bankrupt, have CCJ’s (country court judgements) against you or you have done an IVA (individual voluntary arrangement) then you already know that a credit file clean-up will be required. You really need to know how to wipe your credit history clean in the UK. If you have acquired the debt through the use of a credit card, there are a few things you can try to accomplish this. If this is debt with a particular company, you can get in contact and try and resolve this yourself. If the company drops the debt, this will clear from your file. If this fails, you can get in contact with your local financial ombudsmen. This particular service has been set up by parliament in order to deal with a variety of financial areas and ensure that both partied are treated fairly. They also have the legal power to step in if they believe that this is not the case. Check out our Credit Angel review to find out more details on another service which can help. If you are still wondering how to remove items from my credit report in the UK, there are other avenues to try. You can add a 200-word article called a ‘Notice of Correction’ on your finance record as an explanation for why you have missed certain payments. For example, you have been out of the country and unable to take control of finances etc. In some cases, this can be the deciding factor on whether you lent money or not in the future and banks will take this into account. This being said, it is always better to try and resolve the issue and have the items removed completely if possible. This is one way to improve your credit score and make it easier for you to get loans or mortgages in the future. It is also important to check that these are your debts and that you haven’t been on the receiving end of identity fraud. If this is the case you must add the note to your file and get in touch with your financial ombudsman. There are many online searches for ‘how to remove discharged debt from my credit report’ and answers can vary depending on who you get in contact with. Experian will receive regular updates from the insolvency service in relation to debts and therefore records will reflect your current financial standing. This being said, if you have filed for bankruptcy, this will generally stay on your report for a further 6 years before being removed. You can check your own credit score using services like My Credit Monitor which are really helpful. CCJ’s will also be removed automatically 6 years after the judgement date, however, lenders will pay less attention to these the older they become. Once your debt is no longer an issue, you can take out a credit builder product which will help with your credit file clean up. A credit builder card will allow you to gain the trust of lenders by consistently borrowing and repaying, thus improving your overall score. When looking how to get a default removed from your credit file you become aware that bankruptcy and county court judgements will be removed automatically after 6 years however this is not always the last of it. A lender is still able to chase you for the debt as unless this is statute barred. A debt which is statute barred cannot be pursued by the lender once it has outside of the specific period although this debt will still be listed on the credit file. A file report will not show if a debt is barred however you can contact advisors such as https://nationaldebtadvice.org.uk/ for more information. If an account that does not belong to you appears on your credit record system then the first step will be to contact the lender to dispute. If this does appear on the file they should remove this as soon as possible. If you are working to remove items from a credit report legally, it can often be very time-consuming. Speaking to an agency can speed up the process and allow you to ask for advice on the matter. Certain debts can stay on your debt account for 6 years however they become less of an issue, the longer they are on the system. Find out more about credit scores first if you are unsure on how they work. The best way of getting a debt cleared from the credit file would be to contact the lender and agree that it was not justified in the first place. If you cannot agree that the debt was unjustified, the lender will have had a duty of care to report this and it will remain on your account information for the 6 years. With many lenders looking at your most recent financial history, delinquent accounts can become less troublesome the longer they appear on your credit file. After 5 years on your file, flagged items are much less likely to affect borrowing. Take a look at our Equifax review for more details on another great service to help you check your credit. This being said, any default on your account can still put lenders off and it is always good to know how to get delinquent accounts off a credit report. If disputes on your credit file are due to unfortunate circumstances that are out of your control (such as illness, family bereavement etc.) then it always worth noting this on your account.